TeamTaskManager is a free online task management system to manage tasks and collaborate with others. You can create a team and assign as many tasks as you want to different team members. Whether your colleagues are with you or somewhere else, they can easily collaborate to accomplish the assigned tasks. You can assign individual tasks to team members, define roles (either as admin or user) and prioritize the tasks accordingly. It also shows report for implementation of tasks and workload of team members. This website always provides notification to team members about the progress and actions with tasks. Similar to other online task managers, when you add a new task, it will ask you to define the “Initiator” and “Executor” of the task. To search any task, each team member can create new filters and change the default “Initiator” and “Executor” filters too. The following screenshot shows an assigned task with its priority, status, work content, date of completion, etc. This website works exactly like another task management website “Azendoo“, but has some distinct features like you can view task tree, hierarchy, break tasks into sub-tasks (unlimited), combine tasks as project, and much more. It has a “Comments” tab which can be used to clarify and discuss the actions about a task with team members. To accomplish a task by collaborating with others, you can set the priority of the task as required and also maintain the status manually. Note: You can add as many team members as you want and manage unlimited tasks absolutely free. Simply go the TeamTaskManager’s homepage and register yourself for using this amazing online task management system. Simply click the “Add” tab in the main window of the website to assign a new task. After that, you can fill various elements of the task such as task name, work content (in hours and minutes), initiator and executor, task description, and date of completion. You can also set the priority of the task as high, medium or low and update the status manually as assigned, in-progress, suspended, completed, finished, rejected, and deleted. 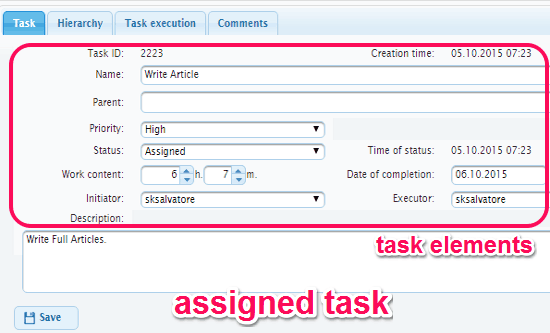 In the same manner, you can add sub-tasks by clicking the “Add Subtask” within the parent task. The following screenshot shows how to add a new task by filling it’s elements. Instead of scrolling through all the tasks to find a specific task, you can use default search filters or create your own custom filters. 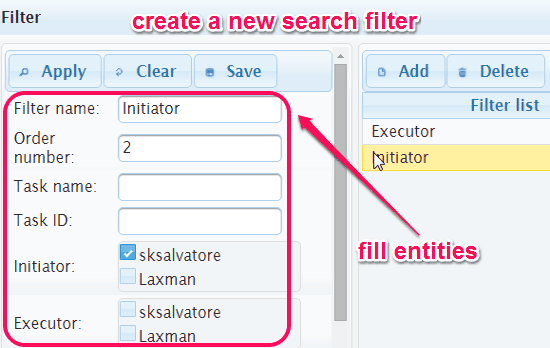 To create a new filter, simply click the “Filters” tab in the main window and fill up it’s entities. 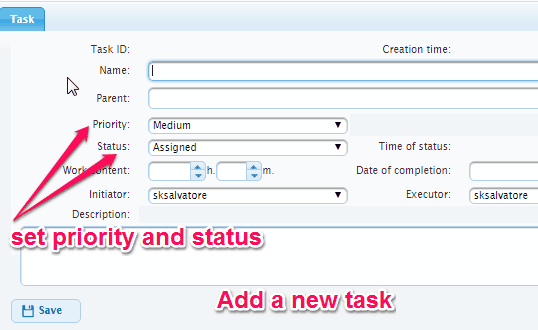 Add filter either as “Initiator” or “Executor” and fill entities like filter name, task id, priority, time status, etc. The following screenshot shows how to add a new search filter. Simply go to Menu → Users to add new members in a team. 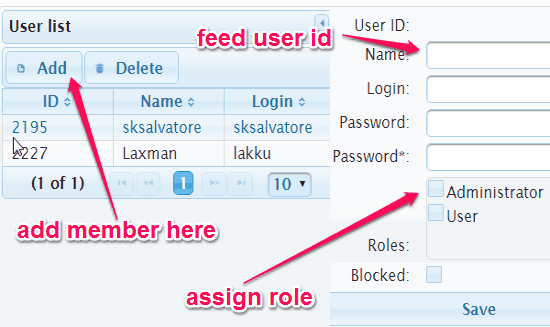 Now, feed user id of each member and assign their role in the team either as administrator or user. You can also create custom roles as you wish. As soon as they join the system, their user id, name, and role will be visible in the user list. Whenever you create a new task, simply assign these users either as “Initiator” or “Executor”. The following screenshot shows how to add a new member in a team. You can simply go to Menu → “Workload Report” or to Menu → “Progress Report” for viewing the reports of the assigned tasks. It lets you view report either by filtering all the team members or by an individual user. 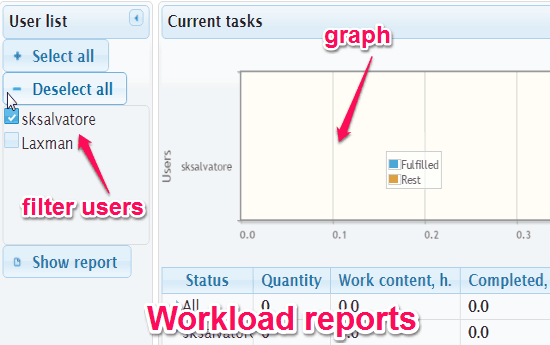 The workload report shows a graph of completed tasks, quantity, fulfilled and rest work contents, etc. In the priority report, you will be able to see the priority of the task, status, creation and due date, work content, etc. The following screenshot shows workload report of some assigned tasks. TeamTaskManager is very useful and efficient online tasks manager which lets you add unlimited tasks and assign them among multiple collaborators. You can add as many users as you want in a team to accomplish a task by collaborating. To make it easier for finding a task, you can create custom search filters and replace the default filters. The workload and progress reports are well managed and generated with accuracy. Try this website from the link here. A tech enthusiast and loves to write reviews about software, websites, and mobile applications.